Starting in November, Tactical Sh*t will be collecting donations through their website in support of the GallantFew. Tactical Sh*t is proud to announce their support for the GallantFew, an organization who helps veterans transition back into civilian life. Starting in November Tactical Sh*t's website will be accepting donations from customers who choose to round their order to the nearest dollar before completing their order. 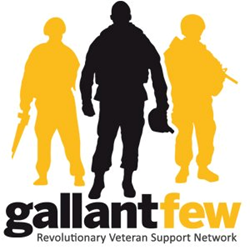 The GallantFew is a non-profit 501c(3) that has helped veterans since July of 2010 facilitate a peaceful, successful transition from active military service to a civilian life filled with hope and purpose. The GallantFew supports the Darby Project which focuses on hometown Ranger veterans mentoring program and the Jarhead Project for Marines. The non-profit organization provides Law Enforcement Training that includes awareness for warfighter issues and de-escalation tactics to reduce the potential violent interactions, as well as Veteran Small Business Education that identifies and couches veterans who qualify for special federal small business opportunities. The organization provides a great connection and support system for those who need PTSD treatment. Serving in the military can be difficult, it is not only demanding but also dangerous. However, the return to civilian life also creates challenges for the men and women who have served. The transition for some can be very difficult and stressful, especially when it comes to finding employment. A Veteran may have never looked for, applied for, or interviewed for a civilian job, especially if he or she has only had a career in the military. That’s why it is so important to support organizations like the GallantFew. “As a former LE that saw my share of violence and death, I want to help those who have done more and seen more than I. I am proud that we have found an organization that is REAL and really helps our veteran operators suffering from PTSD and that need help integrating back into the so called "real world”,” said TJ Kirgin, the CEO and founder of Tactical Sh*t. TJ is a former gang and narcotics unit police officer from St. Louis, Missouri. Tactical Sh*t was created in January 2013, as a social community that caters to shooting enthusiasts, law enforcement, military and special operators. Now a full-fledged online store and soon-to-be retail store in St. Charles, Missouri, selling tactical gear. Tactical Sh*t has now grown to over 200 thousand Facebook fans since its release date.